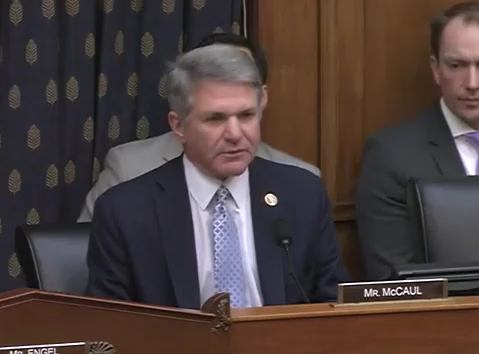 Washington D.C. – House Foreign Affairs Lead Republican Michael McCaul (R-TX) delivered the following opening remarks at today’s full committee hearing to assess the effectiveness of U.S. foreign assistance to Central America in addressing economic and security drivers of migration. “The Northern Triangle countries of Central America continue to face serious economic and security challenges that are threatening the region’s stability and driving illegal migration to the United States. “This migration from El Salvador, Guatemala, and Honduras is exacerbating the crisis on our southern border and straining the capacity of DHS’s Customs and Border Protection and others. “As the former Chairman of the Homeland Security Committee, I understand the unique challenges we face at our border and am committed to using all tools at our disposal to address this crisis. “One of the most effective tools we have for responding to this is targeted foreign assistance to Central America. “This assistance supports the Northern Triangle countries’ efforts to combat Transnational Criminal Organizations like MS-13, that are involved in the trafficking of persons and drugs. U.S. assistance also promotes economic prosperity and strengthens democratic institutions and rule of law. “This assistance merges security and economic support to create stability in the region and address the root causes of illegal migration. “The Northern Triangle countries have also responded with their own initiative called the Alliance for Prosperity to complement U.S. assistance demonstrating their commitment to addressing their own challenges. “Our assistance is having positive results. “The Chairman and I went down there. We were in El Salvador, we saw it. Throughout the region, USAID programs are increasing agricultural production, increasing household incomes, and creating jobs – 78,000 jobs in Guatemala alone. “Other U.S. assistance programs, funded through State’s Bureau of International Narcotics and Law Enforcement, directly support police enforcement operations including those by vetted units like the FBI’s Transnational Anti-Gang (TAG) units and DHS’s Transnational Criminal Investigation Units (TCIUs). “Both have contributed to the indictment of hundreds of MS-13 gang members, the prosecution of transnational criminal organizations, and the collection of biometric data of individuals suspected of terrorism, violent crime and trafficking through BITMAP. “Last month, I traveled with Chairman Engel to El Salvador and we witnessed first-hand how our assistance is driving at-risk youth away from criminal gangs like MS-13 by providing technical skills and employment opportunities. “During our visit we had the pleasure of meeting with the President-elect of El Salvador, who expressed his unwavering commitment to working with the United States in every way possible to address the migration crisis. “He also explained China’s efforts to increase its presence in his country, but he favors closer engagement with the United States. Cutting this aid, in my judgement, would create a void that China is prepared to fill. And we heard that from the President-elect of El Salvador. “As a Representative from Texas, this crisis on the border is taking place in my backyard, and I share the President’s frustration. “However, I acknowledge that more work and time is needed to fully address Central America’s challenges and the continued migration flows to the U.S.
“I believe that the decision to cut funding will make the economic and security situations in Central America worse, not better, triggering more migration, not less, to the United States. “I also recognize Congress has an oversight role, and I made this clear by establishing a process which clarifies that we have the criteria to address 16 congressional concerns related to improving border security, anti-corruption, and human rights. “In short, our trip to Latin America was significant; meeting with the President of Colombia; meeting with the President-elect of El Salvador. I think the Chairman and I came back realizing these programs are highly effective and that cutting these programs would be counterproductive and make the situation worse, not better. “I want to thank the witnesses for being here today, I want to thank the Chairman for holding this hearing, at my request, after we came back. “And I will anecdotally share this story, with the President-elect of El Salvador; we were there the day the President decided to cut the foreign aid. It was quite a shock to an ally; someone who is pro-U.S. and wants to be our ally. “I think its the wrong message at the wrong time. I think this is ill advised; it’s reckless.